ChuChu TV, Asia-Pacific’s most watched YouTube channel for toddlers from India, has launched the global Consumer Products business for the brand. 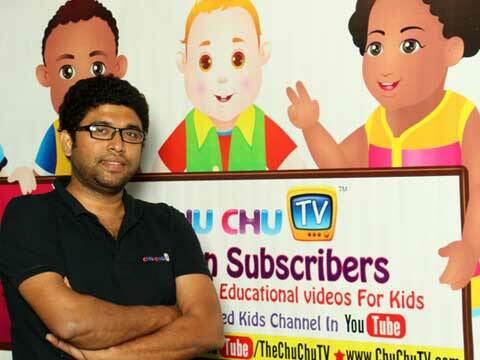 Boasting over 6 billion views and 10 million subscribers, ChuChu TV is confident of licensing being an effective strategy, states Vinoth Chandar, Co-Founder, CEO & Creative Director of the brand. Talk to us about the brand ChuChu TV. ChuChu TV was born purely out of passion. It was started when I wanted to make my daughter Harshitha laugh. I thought of creating a video and naming it ChuChu which is what she is fondly called at home. I did the rhyme Chubby Cheeks that starred a small girl who looked like my daughter. I then put it up on YouTube and I was surprised it got around 3 lakh views within weeks. I later uploaded the second video Twinkle Twinkle Little Star which got even more popular and we had around 5,000 subscribers with just two videos. This was when I decided to venture into this domain and create more pre-school content. Understanding the potential, I took this ahead with my partners. This led to the birth of ChuChu TV Studios. Today ChuChu TV has grown to become a kids brand that uses the power of positive messaging, music and learning to connect with infants, toddlers and parents around the world. What made you think about licensing as an extension tool? I have always believed that licensing is an effective strategy for ChuChu TV as strategically it is a good direction for us from growth perspective. In fact within few months of the launch of our YouTube channel, we did some sample toys of our characters so see how they look. We then posted it in our facebook page and got a huge reception from our fans. We have seen that there are many digital properties that have ventured into this domain. Given the admiration that we have seen in our content, the recognition that our characters have received and that kids love our content and parents trust our content, we feel licensing is the way. Our characters ChuChu, ChaCha, Chiku, and Chika have been in all our videos right from the inception. We also have added many new characters to our brand namely Mr.Harlo, The Unicorn Elephant, Cutians the Kittens, ChuChu TV Police, Mr.Eggsie, Wanny & Spanny from ChuChu TV Funzone. We regularly get emails asking us to provide them with our merchandise. We then met with Jiggy George, Founder & CEO of Dream Theatre, and we started our licensing program with them who are currently helping evolve the licensing strategy and find mutually beneficial partnerships. With us being an international brand, having a global presence through merchandising will be an added advantage. What are the immediate categories that you are looking for an extension? We are looking to focus on toys, gaming, publishing, and apparel as our core categories. We aim to launch it in 2018. What will be the point of sale and price points? It’s too early to speculate on this, but we would want to reach out to masses and classes – so it will be aggressively priced. According to you why should a retailer become a license for Chu Chu TV? Our performance speaks for itself. We are a ‘made in India’ and distributed around the world brand. Our fans are eager to engage with us on different platforms and we will work selectively with like-minded partners who share the vision and passion! What are the parameters for an ideal licensee? Strong consumer focus, proven track record, ambition with the calibrated approach are what matter to us while choosing a licensee. We have poured our heart and soul into ChuChu TV – we expect the same commitment from our partners. What is your take on licensing of YouTube-centric IPs? Youtube is a great platform for artists and content creators to showcase their talent and products. With over 1 billion daily Unique Users – it’s extremely impactful. Many brands have been built on the back of this popularity including ChuChu TV. As long as you’re delivering beyond the customer expectations, the sky’s the limit. What potential do they hold in India where internet penetration is yet to increase? India has over 250 million broadband users and while it’s growing aggressively there is significant headroom. We are very excited about the growth opportunities in India and overseas in markets where broadband penetration is a lot more pervasive. Our #1 market continues to be the US.